We are not just a high street fashion company, but are driven with zeal of providing the best possible look for our customers. In doing this, we offer complimentary Styling, Makeover and Photography/Cinematography services to our Customers. In providing these services, we work with the very best in the industry to deliver complete satisfaction to our Clients. We also guide our Customers in making the perfect choice, as regards our products and services. We are not just a high street fashion company, but are driven with zeal of providing the best possible look for our customers. In doing this, we offer complimentary Styling, Makeover and Photography/Cinematography services to our Customers. Was well pleased with the suit. Fitted well and the quality fits the price too. Was particularly impressed with the quick delivery response -very good product and service. Thanks. Very distinct, classy and stylish actually, I don't know if I'm being selfish, but I kinda secretly hope no one else finds out about these, cos I wanna Rock them all! The revolutionary Genius 9000 Rose Gold electric toothbrush features a dentist-inspired round head that oscillates, rotates and pulsates to break up and remove up to 100% more plaque than a regular manual toothbrush while the specialized polishing cup removes surface stains for whiter teeth starting from day 1. 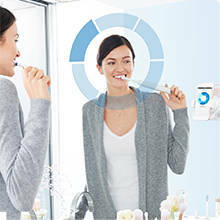 Electric toothbrush with position detection technology helps you know where you’ve brushed so you never miss a zone. Quadpacer timer encourages attentive brushing of each quadrant of the mouth. 6 cleaning modes: sensitive, whitening, massage, polish and deep clean. 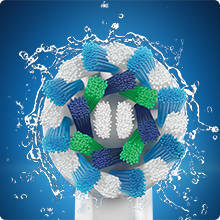 4 brush heads: 2xsensitive clean, crossaction, flossaction brush head. 10500 rotations and 48000 pulsations per minute. Ergonomic handle – to make the brush more comfortable to hold and use. 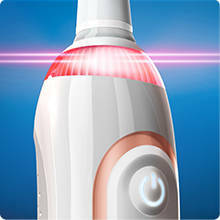 Visual pressure sensor stops pulsations when you brush too hard. Travel case included for when you’re on-the-go. Rechargeable: 12 hours for full charge. 56 minutes usage time, based on 2 minutes twice a day. Oral-B’s round head contours to each tooth for cleaner teeth and healthier gums versus a standard manual toothbrush. Pressure control reduces brushing speed and SmartRing alerts you if you are bruising too hard. 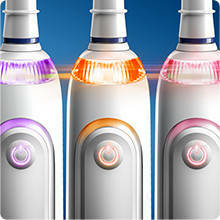 The only toothbrush that can see where you brush and guides you to cover all areas of your mouth for a thorough clean. Gently whitens your teeth starting as of day one with polishing cup that holds toothpaste and delivers it where is needed to remove surface stains. Personalise your brush with the 12-color LED SmartRing and six brushing modes. 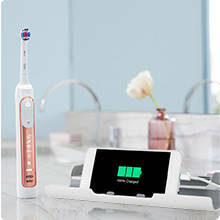 The Oral-B Genius 9000 has a state of the art Lithium-Ion battery to last up to 12 days and comes with a dual charging travel case to charge both your toothbrush and phone with one plug. Oral-B Refills are designed to perfectly fit your toothbrush and come with specialised features for amazing results, like end rounding to be gentle on gums, angled bristles to clean in-between teeth, and UltraThin bristles for extra gentle cleaning. 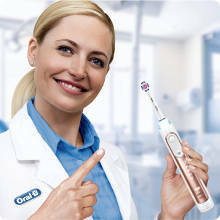 Oral-B is not only designed with dentists, it is also the number one toothbrush brand recommended by dentists worldwide*. 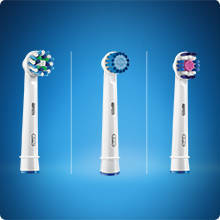 Discover yourself the next level of oral care by Oral-B. with FREEVIEW, WLAN, NETFLIX, SOCIAL TV, and more! ALL-IN-ONE: Universal Power Adapter: From Europe to Ireland and anywhere in between, our universal travel adapter plug will help keep you connected in over 150 countries! Featuring four plugs and a handy worldwide power adapter, you can use standard wall AC adaptor outlets virtually anywhere. WARNING THIS NOT A VOLTAGE CONVERTER! QUALITY: World Travel Charger is a high quality all-in-one Travel Adapter. We use the latest manufacturing methods, strict testing and quality control to ensure we deliver your Travel Adapter in perfect condition. POWER UP YOUR TECH - World Travel Adapter Intelligently charges almost all Devices with SMART POWER IC Chip inside: Apple, Samsung, Sony, Blackberry, HTC, Lenovo, LG, ZTE, Huawei, MP3 Players, Bluetooth Speakers, Tablets, Smart Phones, Headphones, Power Banks and Sat-Nav Systems.